Five trio sonatas by Johann Michael Nicolai for the then popular instrumentation of violin, viola da gamba and basso continuo are known. 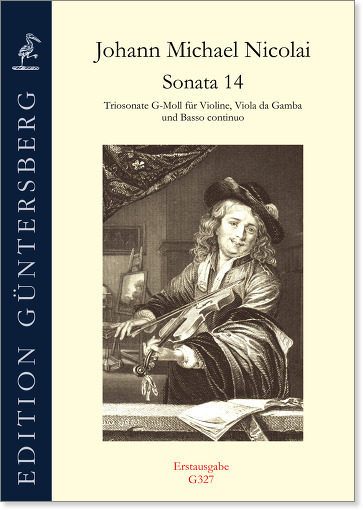 Four of these have been known for some time, but this “Sonata 14” is published here for the first time. The manuscript of it is held in the Durham Cathedral Library, where Nicolai’s well-known sonatas for two and three gambas are also found. The sonata in G minor has catchy and contrapuntally handled subjects and consists of several conjoined sections, which also contain a solo for each of the melody instruments.